Parking is available in the Seton Center lot. Additional parking is also available at Moore Park (make a left out of the Seton Center parking lot, Moore Park is 0.2 mi down the hill on your right). The Seton Center is handicap accessible. To reach the Seton Center Brookline facility from downtown Pittsburgh, take the Boulevard of the Allies east to the Liberty Bridge. Cross the bridge, proceed through the Liberty Tunnel and turn left up Pioneer Avenue just 0.1 miles from the tunnel exit. Follow Pioneer uphill 0.8 miles. Seton Center is on the right-hand side. We're proud to host all of our performances at the Seton Center. Not only have they given our company a home but they have a wonderful mission that we hope you'll read more about below. In 1941, the Sisters of Charity of Seton Hill purchased the building and property of what had been known as West Liberty Public School in Brookline. 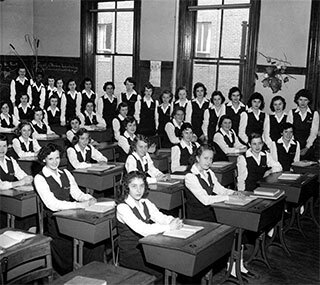 Classes began there that year in Elizabeth Seton High School, founded to offer top quality education to young women of Allegheny County. Eleven years later, a second building was erected on the site to provide an auditorium, cafeteria, kitchen, convent area, chapel and more classrooms, and in 1970, the old West Liberty Building was replaced by a newly constructed one. In 1979, Elizabeth Seton High School was merged with South Hills Catholic High School to form the co-educational Seton-LaSalle Catholic High School. In 1985, the Board of Directors amended the Articles of Incorporation, the property became known as Seton Center, and many of the services carried out today were initiated. 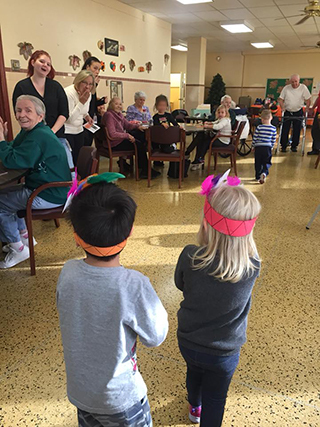 A Senior Center and the Adult Day Services facility opened, a School of Arts was formed, and an after-school program for children from kindergarten to age 12 began. An Advisory Board of business, civic, and church leaders was appointed to offer advice and direction to the managers of the Center. A year later, the Seton Center facility in Overbrook was opened. 1986 also witnessed the expansion of the Child-Care Center in Brookline to include pre-school children from ages three to five, while the Infant and Toddler Care facility was opened in 1992. The Center's programs in Greensburg began in 1987, with the establishment of Adult Day Services capabilities, with Ombudsman services established in 1996 through a contract with Westmoreland County. Today the Seton Center programs in Greensburg are housed in Monahan Center, near the campus of Seton Hill University. To learn more about the Seton Center & it's mission visit: www.setoncenter.com.